“Bets n’ chips” – Implications for investors on the frontiers. There seem to be two types of bets that investors make when doing a deal. A bet on the team. A bet on the plan. The closer to the frontiers (early stages and deep change) the greater the emphasis is on the team. And rightly so. We all know that plans don’t last on the frontiers. So how can we get better at investing on the frontiers? Surely betting on the team alone isn’t a sound investment strategy. From my conversations the current practices seem to be either focused on ‘rolling up the sleeves’ and getting involved directly (few, high-cost investments) or being a hands-off patron (many small investments). Either that or back off from the frontiers and use conditional investment to achieve specific results (e.g. disadvantaged employment or other enviro-social activities). The limitations in each of those should be fairly self-evident. So what else could we make bets on? Well if venturing is a process, we could bet on the process they are following. If we know plans are not static, what is the venture doing to continue the process of framing, planning, and connecting? And what other practices could we employ? Well if one of the biggest chips an investor brings to the game is their social capital, well then how can that capital be better employed in the task of connecting? Going back to the image above, we can see that at minimum it requires a venture to have articulated simple and accessible spaces. I wonder – how many entrepreneurs and their investors would truly describe the primary spaces of their venture in the same way? How about in your venture or your portfolio? My bet is that’s strongly correlated to the difference between friction and luck. their spaces (accessible and simply articulated). And it means bringing our social chips into the game to make the connections the venture truly needs (more in a future post). Now that’s an investment space I’d bet on. Posted on February 12, 2008 Categories UncategorizedTags frontiersLeave a comment on “Bets n’ chips” – Implications for investors on the frontiers. Venturing and venture investing on the frontiers – in simple terms. My focus is on venturing and venture investing ‘on the frontiers’. My work is focused on being able to systematically improve ventures and venture investors operating on the frontiers. My belief is that by focusing here, practices can be developed and demonstrated that will themselves become conventional in time and thereby move ‘the frontiers’ greatly increasing our society’s ability and capacity to take on our civilization’s greatest challenges. So how will ventures be different after employing these practices? And how will venture investors be different? better able to go deeper into realizing non-financial aims (particularly relevant for ‘social’ venture funds. And what’s at the root of what’s different? 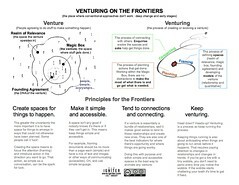 Posted on February 4, 2008 Categories UncategorizedTags frontiersLeave a comment on Venturing and venture investing on the frontiers – in simple terms. Many things have been picking up the ‘social’ modifier lately. Here are some of the ones I’m encountering and what I think they mean. Clearly, each of these words describe fields with much activity and research into how they work. Adding the modifier, at best prompts the question of how, when modified, is it different. In my perspective it’s the realization that things aren’t linear – and in fact are ‘chaotic’ – which then calls on the research of systems science and it’s theories on complexity and systems. And it also seems to be best done in an ‘open’ way – or maybe better put – those that are in the depths of doing this stuff tend to do ‘open’… which of course… is another story. Exchanges are a hot topic in the social capital markets. They are appealing in the sense of the efficiency they promise. Efficiency is good – and it also has a dark side. This dark-side, which I’m considering the ‘inherent evil’ in exchanges, is their tendency to disconnect/dissociate the ‘buyer’ from the ‘seller’. It comes out in things like the sub-prime mess and rogue traders. So how do we get the benefits of this ‘masterpiece’ of capitalism? To me that means looking as much or more to social networks as it does financial exchanges. I know there are some folks working on local exchanges who have acknowledged this ‘evil’. I’ll be particularly interested to see how they address it – from all the angles I’ve looked so far it seems to be a tough balance. Posted on January 28, 2008 Categories UncategorizedTags exchange, social finance marketplaceLeave a comment on The ‘evil’ in exchanges. This biggering is buggering… a call for a new vision of ‘prosperity’. I attended a session for Sustainable Prosperity last week and was left with a pretty big realization that evolved for me into what blurted out in a strategy session for Windfall Ecology Centre on Friday as..
Obviously, this is inspired by Dr. Seuss’ “The Lorax“, (see the specific quotes here), but it also refers to a growing realization that the thing that economy is based on – continuously increasing consumption – is reaching a breaking point. To be clear, this isn’t a recession inspired ‘people aren’t going to consume as much anymore’ statement, it’s a ‘if people consume anywhere near what we’re consuming we’re all screwed’ statement. “Story of Stuff” by Free Range Media for the Tides Foundation makes a simple and decent case for that. So getting back to Sustainable Prosperity, I can’t help but think that if any new definition of prosperity is going to have any impact, it has to address this, and the other underpinning of our society, if the individual doesn’t prefer it for their own selfish motivations, no level of altruistic appeal will change their behaviours. The 60 minutes “House of Cards” segment on the sub-prime mess shows some of that with a shocking display of people’s self-interest at play. It’s easy to argue that’s not likely to happen – when the furthest our ‘greatest’ capitalists go is ‘creative capitalism’ (Bill Gates) – but I can’t see how anything but will have a chance of getting at the root of what we’re dealing with. Imagine though what Gates or Buffet could do if they backed that kind of a definition. Things are broken. We need a new basis to start from. Personally, I can’t deny it anymore… this biggering is buggering and so I’m beginning again. “Do some of us win? Do some of us lose? Is winning or losing something I choose? Why am I racing? What am I winning? Posted on January 28, 2008 Categories UncategorizedLeave a comment on This biggering is buggering… a call for a new vision of ‘prosperity’. Just saw this post tipping me to VenCorps which seems to be a venture fund using ‘crowd sourcing’. I’m going to be interested to see how it goes and expect they will do well by essentially ‘amping up the network’. My guess is that they will be better at dealing with ambiguity (related to progressing along stage of development) in ventures but I’m curious to see if it will help them deal with complexity (related to depth of systemic change). The thing that gives me a sense that they won’t be as effective here is the military style they are coming out with. That to me indicates a very linear, command and control approach which is not effective in dealing with complexity. Looking forward to learning more and seeing how it does. Regardless of how it performs its great to see the innovation in venturing.